Includes judgments from 6 U.S. federal judges who ruled against Noreen Renier since 2006 and testimonials from investigators, researchers, police officers, and journalists. Part 2: Renier's descriptionss of events. Psychic Noreen Renier never provided the coordinates of a missing crashed airplane with survivors. Yet this is the case that made Noreen Renier famous until it shattered her credibility. On March 1, 2015 psychic author Noreen Renier was interviewed before a radio audience of 2.4 million listeners. In just four minutes she made 17 spectacular claims about finding a plane that crashed west of Boston (United States). In 2019 we know all 17 of her claims are exaggerated fiction. The crash wreckage was strewn over 45 meters (150 feet), and the medical examiner determined all passengers died on impact. Renier's claims are likely the greatest TV and radio scam by any psychic ever. This 2019 update below includes comments by witnesses, police, reporters, and official photos. 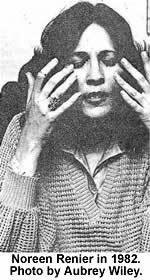 Before declaring herself a "super psychic" Noreen Renier was a professional actress. Investigations from 2006 into 2019 verify Noreen Renier has staged her airplane charade for decades and misled a worldwide audience of over 10 million. Understanding how delusional Noreen Renier is about this case offers a glimpse into how she fabricates claims for attention and money. In 1986 "missing person police psychic" Noreen Renier calmly sat before a tiny six member jury in a small town just over the northern California border (U.S.A.), in Phoenix Oregon. The town had a population of less than 2000 people and she had filed a libel lawsuit at a local courthouse. A critic she claimed had maliciously damaged her psychic life and had failed to check his facts that showed she "was instrumental" in helping find a lost plane. Over three days Noreen Renier testified of her incredible powers in finding the plane. Before a jury of her 'neighbors' she recalled how she had located the lost plane by "flying over the landscape" and telling searchers to go where she visioned survivors. "January 28, 1984. A small chartered plane carrying four passengers had mysteriously vanished from the sky somewhere over rural Massachusetts or New Hampshire. . . . Reaching into the unknown, I began searching for the airplane. I saw the downed plane immediately. In fact, I found myself almost on top of it". Cascading court rulings against Noreen Renier had already opened the door for hired investigators to locate witnesses that have now refuted every one of Renier's claims about her plane case. Dozens of those fabrications we include here. The combing for witnesses began after a Florida State court settlement breach by Noreen Renier. That in turn resulted in a Washington federal court ordering judgments against Renier in both 2006 and 2007. Those rulings then prompted four subsequent federal court judgments against Noreen Renier in three additional federal courts. One as recently as April 18, 2012. But even in 2006 witness after witness was disputing Noreen Renier's version of her airplane case. Yet Noreen Renier has just continued compounding her falsehoods. In 1986 she was handed a newspaper article while on the witness stand in an Oregon court. The article she read while under oath stated that the medical examiner at the crash concluded all passengers died instantly. Yet just weeks after the court case ended Noreen Renier began referencing to reporters one or two survivors at the crash site. Asked by a critic in 2014 why for three decades she's claimed a young man walked after the crash she said he didn't know his facts. She told the critic that a medical examiner had proved she's correct after they discovered plant burrs ("stickers') on the victim's pants that proved he had walked after the crash. But GNR investigators verified her claim is yet another lie. An examiner after re-examining the original report called Renier's claim "complete rubbish" as "the victim didn't walk or carry anyone as he was dead. This wasn't an episode of the Walking Dead. Real people died. To suggest otherwise is absolutely nuts." Within the 83-page report of by the National Transportation Safety Board (NTSB) the statement is "dead on impact." Yet in her March 1, 2015 broadcast interview on 'Coast to Coast AM' Noreen Renier again portrays a young man surviving and "they knew her brother had walked because there were stickers on his pants where he had walked." 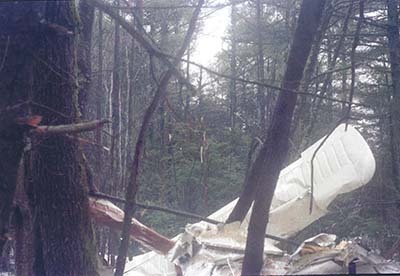 Photos of the crashed plane show an impact force that drove tree trunks exceeding 66 centimeters around (about 26 inches) completely through the wings and main cabin. With a gross weight of 1,179 kg (2570 pounds) without cargo or passengers the plane literally shattered across a debris field of 45 meters. Passenger seats (which are bolted down during assembly) were ripped from the plane's cross structure and tossed outside the plane. 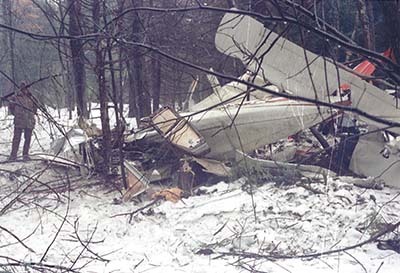 GNR investigators believe this is the first time the NTSB photos have ever been published. After reviewing the NTSB report a former United States Civil Air Patrol investigator stated "No one survived the impact. No one could have survived those kind of forces. If the lady is claiming survivors she's completely nuts. Every investigator in the NTSB and forensic reports state deaths on impact including the medical examiners on site and those filing the death certificates. Hell, the photos alone make it pretty clear." The NTSB photos shown on this website were taken at the crash site just hours after the plane was found and also highlight yet another Noreen Renier falsehood in her March 1, 2015 broadcast interview. Noreen Renier stated that the day before the plane was found there had been a "blizzard" after it "started snowing" and "so the planes had to stop" searching. But the NTSB photos show the ground having only 2-16 centimeters (1-6 inches) remaining from the prior week's heavier snowfall. The weather the day before the plane was found had been 7 degrees Celsius (45 degrees Fahrenheit) with a low of 3 (37 Fahrenheit). It had briefly drizzled with fog across the large swamp surrounding the forested crash area. And nothing had prevented search teams from entering the area as there had been no new snow. The famous blizzard of 1984 didn't happen until one month after the plane was found. And there hadn't been a previous blizzard in the area for over five years. While other search teams had gone through heavier snow a week earlier, the party that found the plane walked in. The snowmobiles Mrs. Renier mentions wouldn't have made it across the swamp or into the forested area the day the plane was found. Well before these facts were compiled and the eye-witnessess found, many followers of Noreen Renier had spoken highly of Noreen Renier finding the plane. In 1986 Robert Ressler, the former director of the FBI's Violent Criminal Apprehension Program, cited her assistance in what she portrayed as a psychic bombshell case. In 2019 Mrs. Renier continues to showcase such remarks even though for over 30 years they have been proven as lies. As of early 2019 her website continues to show quotes from FBI Special Agent Robert Ressler in 1988 stating, "She helped to locate a plane containing the body of a relative of an FBI agent" and "She is the best!" But as we showcase here that was before facts came to light beginning in 2005. In Noreen Renier's book A Mind For Murder, she added that FBI Special Agent Ressler assisted in her defense of in an Oregon courtroom in 1986 --- just over a one year after the airplane crashed. Mrs. Renier testified before the jury that she was "instrumental in helping to find an airplane that had crashed in Massachusetts." Carolyn Porter, passenger, age 26, who was born November 6, 1957 in Vermont, U.S.A.
Charles Principe, pilot, age 57, who was born May 18, 1926 in Massachusetts, U.S.A.
Arthur Herbert, passenger, age 29, who was born January 31, 1954 in Virginia, U.S.A. While Noreen Renier claims she "saw the downed plane immediately" in fact by her own testimony she confirmed that she never picked up the phone and called emergency rescue personnel stationed at either of the two police agencies within 2 miles of the crash. Nor did she call airport search and rescue personnel. Local police records show she was never at the crash scene nor visited the airport search center while the crash search was active. Nor did she ever contact any Massachusetts local, municipal, State, or Civil Air Patrol investigators. This differs significantly from the portrayal she provides in her book A Mind For Murder, and is a central distortion readers should recognize. Renier writes in her book that the recommendation to use her on the case was "validated by [FBI] Special Agent Robert Ressler" and "Robert always backed me up, especially in the face of skeptics, and recommended my services to the police." From 2007 through 2010 Noreen Renier included an article on her web site from the Journal, based in Durham, England, and dated July 12, 1997. She states "I came out with the longitude and latitude, and the number of miles away it was --- not bad for someone who can't find their way around a grocery store!" And on July 31, 2005, in an article in the Lynchburg News & Advance, she stated "I've found a wrecked plane a thousand miles away! But none of it is true beyond that a plane did crash near Gardner, Massachusetts. In June 2006, Renier's critic, John Merrell located two people who knew about the crash. And these two residents from Massachusetts --- not psychic investigator Noreen Renier of Virginia --- actually found the specific plane Renier was hired to locate. 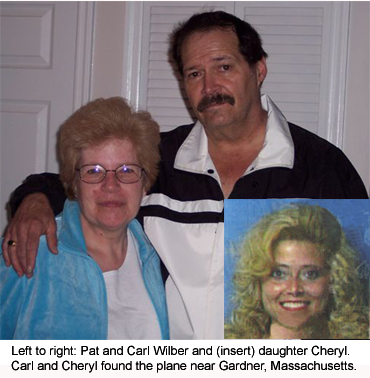 Amazingly neither of the two people who found the plane ---- Carl Wilber and his daughter Cheryl --- had ever heard of psychic detective Noreen Renier who claims to have searched and found the same plane they actually located! Mr. Wilber told Merrell after reviewing A Mind for Murder (co-written by Naomi Lucks), that psychic investigator Noreen Renier "doesn't know what she's talking about. . . . I don't think she's got anything right. . . . My daughter and I found the plane ourselves. . . . We never heard of her. . . . She's lying". A review of local newspaper articles published at the time of the crash shows Carl (much the same as he appears today) and his daughter as the actual finders of the plane. The missing plane was not found because of any psychic involvement, nor was it found because of any psychic search assistance from Noreen Renier even indirectly. Nor was the crashed plane lost "a thousand miles away" from Renier or considered by local police to have crashed in New Hampshire. Detective Lieutenant Gerald Poirier, of the Gardner, Massachusetts, Police Department, is the commander of the North Worcester County Drug Task Force and was on duty the evening of the crash. In June 2006, he assisted Merrell in obtaining police reports and background about the crash and massive search. After providing Merrell with a tour of the airport and showing him maps and aerial photography of the area, he told Merrell, "We knew for a fact [the crash site] wasn't in New Hampshire. Lt. Poirier showed Merrell just how narrow the search area around the Gardner airport had become just 24 minutes after the crash. The airport is actually split between the cities of Templeton and Gardner Massachusetts. A pilot on the ground (Ronald Richard) phoned in the report of the crash from the airport and --- according to newspapers published the week of the crash --- estimated the direction coordinates of the crash site to within approximately 2000-3500 feet of the Gardner airport. 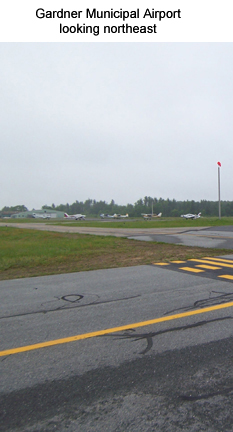 New Hampshire is more than 10 miles further north of the airport. As Noreen Renier claims to have re-created the events of this specific crash in her mind as they happened why does she mention New Hampshire? By the time she was brought into the case (more than a week later), no one thought it was in New Hampshire as witnesses at the Gardner Massachusetts airport reported the crash. Amazingly they actually heard the plane crash approximately 15 seconds after passing low over the airport runway! So why is she confused about the state? Indeed she claimed in testimony she knew the terrain underneath as the plane flew and saw the crash site "immediately." The telephone call from Ronald Richard, who sighted the plane and heard the crash (along with companion Cricket Frost), was placed to the Gardner Police Department at 7:32 p.m. on January 28, 1984. That call to police came just 19 minutes after the plane was officially lost by radar. 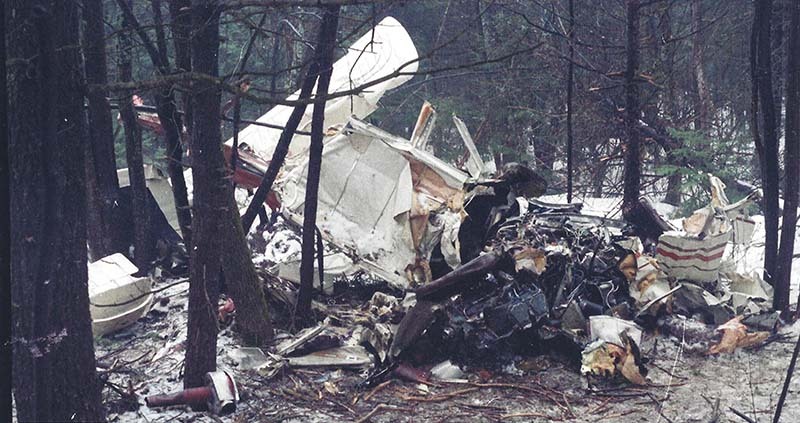 The exact time of the crash was able to be matched when Air Force officials received results of a Federal Aviation Administration review of area radar records, "which indicated an aircraft disappeared from radar contact near the [Gardner] airport at about 7:13 p.m.
Ronald Richard's phone call is listed on the January 28, 1984, Gardner Police blotter at 7:32 p.m. and includes the words "plane crash in woods south of Gardner airport." None of this very specific information of time, location, police involvement, eyewitnesses, or radar tracking is mentioned in A Mind for Murder. Instead, Renier describes the plane as having "mysteriously vanished from the sky" and builds a premise for an unsolved missing person case in desperate need of what she calls her "super psychic" talents. Noreen Renier provided absolutely no foresight about the location of the crash and her discussions with Jessica Herbert further added to the confusion. The terrain Mrs. Renier described was 7-80 miles from the crash site. More than 65 Civil Air Patrol members searched more than 6,650 square miles according to newspaper reports --- when the plane was found less than a mile from where eye-witnesses had reported it had crashed only minutes after the crash! A updated examination in 2015 of Mrs. Renier's statements supports the fact that she likely developed her early statements about the crash from news articles of another plane. That plane had crashed earlier but was also still missing. In fact Mrs. Renier's statements more closely match another plane crash in the state of New Hampshire about 10 miles away! Yet Noreen Renier told millions of television viewers that she provided the longitude and latitude of the crash site. And in A Mind for Murder she writes that "the numbers I had given . . . turned out to be the longitude and latitude of the downed plane. She's repeated this same claim for decades and made in again during her March 1, 2015 broadcast interview. In 1986 in her Oregon lawsuit against a psychic critic, Renier's attorney, Lee Werdell, told the jury, "The evidence will indicate that Noreen Renier gave quite a bit of information about where to search; actually some numbers that turned out to be the latitude and longitude of how far it was from a major city. . . . She said it was in a wooded area and a lot of specific things; and described an old woman that had been selling things in kind of a beat-up old house near a Texaco gas station. Noreen Renier writes in A Mind for Murder, "I saw two sets of numbers. Breathlessly, I repeated them. . . . I could feel that they were important. Jeff Rodgers, a Nashville Tennessee (U.S.A.) aviation expert reported "It is very common for most people who hear longitude and altitude to assume you say them as two numbers --- like 45 degrees by 30 degrees. But it's far more complex than providing two numbers. As an example, the longitude and latitude for the Gardner Municipal Airport located just a half mile [0.8 kilometers]from the crash site is N4233.0, W 07201.0. And the Statue of Liberty is located at latitude 40.6897 and longitude -74.0446. Unknown to the vast majority of the public, pinpointing a location, even as big as the Statue of Liberty, is far more complicated than just tossing out two numbers. If so, based on her limited numbers she apparently visioned locations near Lake Ontario, Canada or in the Atlantic ocean between Greenland and Iceland. But who is the "them" Renier claims in interviews to have given these longitude and latitude numbers to? Researcher John Merrell smiles and notes this bigger issue. "Her most notable claim --- one she has repeated for more than 30 years --- is providing the longitude and latitude of the crash site for the missing person search teams. With hundreds of people involved in a search during sub-freezing temperatures Renier claims to have "immediately" seen where the lost party was. And according to court testimony examined by GNR researchers, Boston area realtor Jessica Herbert hired Noreen Renier and Renier then told her "two of the four missing person passengers survived the crash." Yet Noreen Renier avoided any urgency in the visions she saw and simply passed them to Jessica Herbert who had hired her to find the plane with her brother aboard. Herbert apparently received nothing very specific or critical from Renier, and according to her court testimony waited until the following day to discuss it with others. And even then yet another day would pass before an entirely independent party found the plane. Whatever the visions Renier had it appears that none were enough to immediately pass along to authorities. This is a far different scenario than what she has presented to the media since 1985 and into 2019. Even Jessica Herbert testified that Renier didn't actually provide specific longitude and latitude numbers, but "lots of numbers" that she attempted to somehow relate to a map. Herbert stated in testimony, "She [Renier], you know, said some of them could be numbers of major highways, or small back roads, whatever, and so I jotted all these down. Some of them she had feelings were major highways and others she thought might be smaller roads and then she had three other numbers that I've forgotten. . . . And she said 'I don't know what these mean but they definitely have something to do with the location." Before millions of television viewers and readers of Renier's book titled A Mind for Murder the sense is that Renier led authorities directly to the scene of the crash. Yet under oath during a court deposition Merrell's attorney asked Renier which authorities she gave the crash site information to. Statements from this deposition have never been publicly referenced in the media before now. Amazingly Renier responded " ...I didn't give it to anybody, I gave it to her [Jessica Herbert, a realtor, who had hired psychic Noreen Renier to find the plane]." And when asked if she had "any contact with any of the authorities whatsoever" Renier answers "no". So the real fact is that Renier never handed anyone anything that was clearly specific longitude and latitude. Nothing from Renier kept search and rescue members from continuing their efforts across frozen swamps the week before the plane was found. So what did she provide? It appears Noreen Renier created a very elaborate missing person psychic fantasy after first creating fantastic --- but completely untrue --- visions she said before a six-member jury in her 1986 lawsuit against Merrell. And Renier's longitude and latitude numbers --- if they ever existed in any useable manner ---- had nothing to do with finding the plane. But the 1986 jury was provided with that bold and spectacular deception --- the same deception she continually restates before live audiences. While being videotaped in 2006 before an audience outside of Las Vegas she said "I led them from the air as if I was an airplane to where they crashed." But Renier actually only "led them from the air" in her mind. In fact she was in her Virginia home throughout the missing person search. A home not 1000 miles, as she earlier stated, but less than half that --- close enough to easily obtain newspaper and media coverage that had run stories for more than a week. Longitude and latitude numbers are not the only claim Renier is famous for. Renier writes in her book with co-author Naomi Lucks that " . . . Now letters came into my head. . . . H,D, and A. . . . They are significant. . . . They could be initials of towns. . . . They definitely have something to do with the location of the missing airplane." In late 2013 Merrell noted, "There are more than 350 towns and cities in Massachusetts. Why does Noreen Renier only report her awareness of three letters -- not even the full name of a single town? None of the towns immediately surrounding the crash site match those three letters." And backing up psychic Renier was realtor Jessica Herbert's testimony. She testified that the woman according to Renier "had been there for many years and she mentioned dogs. Dogs barking everywhere in the area. . ."
And Noreen Renier --- who was never in the search area in 1984 --- stated under oath in an Oregon court that the old woman "sold things in the camper," this conflicts with the testimony of FBI special agent Mark Babyak who said that Noreen had stated that "an old lady sold supplies to campers." So did the toothless woman sell things in a camper or supplies to campers? On March 1, 2015 Noreen Renier again brought up her story of an old woman to millions of broadcast listeners. Once again, it doesn't matter. Whether it's a badly misplaced reality or a wildly creative fantasy, it simply has nothing to do with finding the crashed plane. 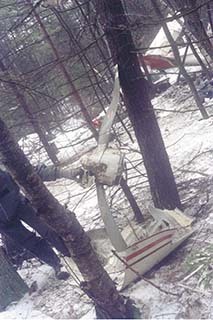 In early February 1984, Carl Wilber and daughter Cheryl found the plane. Carl and his wife Pat, along with their daughter, have lived near the area of the crash site for many years --- Carl Wilber now in his mid 60's for his entire life. Carl remembers the area from more than 55 years ago, and even his daughter remembers it for more than 30 years. They know the area well, as it surrounds their home, and Carl has been an active hunter for more than 40 years in the region --- even 20 years before the crash. They know of no old rickety gas station, nor any woman who sold things in a camper. In fact, with so few neighbors nearby in 1985, the Wilbers were quite adamant that there was simply no such woman at all. Ever. But most amazing is that for 40 years Carl, Pat and Cheryl have had one principal occupation --- the care of dogs. They run two businesses which have expanded into the care of multiple pets, but the taking care of dogs is their principal business. The Wilbers have taken care of generations of dogs throughout the area --- and can match dogs to owners. Over dinner with Merrell they ran through everyone in the last 40 years --- not just 23 years --- in the crash area who could possibly have matched the hunting dog owner Renier described. And Renier's description of that owner is quite specific --- "an old woman who runs the gas station. She doesn't have any teeth. She sells a lot of junk." And Renier's book includes the additional comment, "We learned the toothless old lady had died the year before". Merrell notes, "That's a lot of information to pinpoint someone in the small community the size of Gardner and Templeton. But of course Noreen Renier likely assumed no one would ever check up on her claims". The Wilbers prompted one another about dogs on various streets around the crash site and far beyond. They considered a variety of dogs and owners --- and not just hunting dogs as described by Renier. Their conclusion? A complete fantasy. Their credibility? These are the actual people who found the plane after 10 days of searching as volunteers in often sub-freezing temperatures with ice and snow. In her court deposition taken in 1986 Renier claimed it was this "little gas station that had barking dogs" that gave authorities "a point from up in the air, I told them how they would go up and they would turn, I also gave them longitudes and latitudes, I believe, if I remember correctly, they told me that I gave them the exact miles which I don't know if it is miles where they left to where the plane was or what exactly." On March 1, 2015 Renier added another layer to her delusional story. With 2.4 million listeners she stated "The off duty FBI agents on the ground found the old gas station where the woman with no teeth were and the barking dogs. They found that. Everything was verified." But the reality is that even Renier testified that she never actually spoke to any authorities. So her continued use of providing "them" information is apparently a fantasy since she gave no one but Jessica Herbert information. And who is the "they" who confirmed her visions that she refers to? There is no one on record and she's never cited anyone by name. For 3 decades she just backs her claims with "them" and "they" as validators. All of her decades and references in highlighting hunting dogs near the crash site is also untrue. The site of the crash is a forested area surrounded by a deep swamp which was partially frozen at the time of the crash. What about the "dilapidated little gas station" created from a "old fashioned house" that allowed air search teams to spot a reference by the crash site? Jessica Herbert in her testimony stated that Renier told her about an old woman who "lived in a house but it had been a gas station. . . it had a Texaco sign, rusting out in front of it. She described a lot of stone fence, foundation. . ."
And in May 2006 Noreen Renier was filmed during a Las Vegas area presentation before the International Remote Viewing Association. Her Texaco gas station became "an old rusty Gulf gas station". There are several "old fashioned" houses in the crash area --- but none which was ever in the last 30 years a gas station. And though Renier's attorney also referenced the Texaco to the jury, it has never existed. There was no BP. No Exxon. No Gulf or Shell. No 'Flying A' gas station with a basset hound named Axlerod. Not even the stone fence or foundation of a gas station. Nothing. What the jury heard was only Noreen Renier's fantasy repeated again by Herbert and Renier's attorney. And who, again, is qualified to know the old homes in the area of the crash site? Again, the Wilbers themselves, whose own home was built in the 1800s. "She doesn't begin to know what we know," said Carl Wilber of Renier. In 2015 Renier's media claims about her airplane case continue to expand into further delusions. An audience member at one of her recent 2014 Florida gatherings said she spoke with Noreen Renier. She asked Mrs. Renier why the findings of some forensic examiners don't match-up with her visions in events or how the persons died. Mrs. Renier's reported response was that both police and forensic examiners are looking at evidence after people have died while she can still communicate with dead. Using her powers to directly contact and speak with each of the dead allows her she claimed to 'learn the truth others can't.' This response matches with another statement a GNR researcher uncovered from 2013. "Using my powers of psychometry I'm able to find evidence others don't see. I help police realize many of their conclusions aren't right." A critic in 2015 told a GNR investigator that even though 25 meter tall trees shattered both the plane and passengers Noreen Renier "has the gall to say she's right about survivors --- and the evidence and everyone else is wrong. And her evidence? She claims she got the truth from speaking with the four dead passengers themselves." In Part 2 we examine some of those claims and Mrs. Renier's many bizarre delusions.